Each spring and autumn the estuary of the Alvor river becomes a staging post for thousands of migrating birds. The estuarine ecosystem is also rich in many other ways, and supports numerous animals, plants and insects. Its profound importance to wildlife, both resident and migrant, has been recognised by its designation as a Natura 2000 site, giving it special environmental and conservation protection. 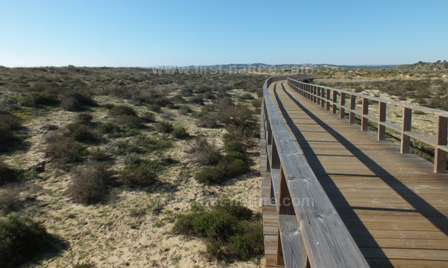 The site covers 1454 hectares, and there are numerous walks of varying lengths which explore its diverse habitats, not just along the beach (or the extensive boardwalk there), but also along the cliffs at Quinta da Rocha and inland along the Alvor river towards the village of Mexilhoeira Grande. Walks away from the beach can be reached from beside the church in the town of Alvor, and along the beach or boardwalk from the beach car park - see below. In addition it is possible to drive down to the waterfront on the other (western) side of the estuary where the River Odiaxere enters the sea. 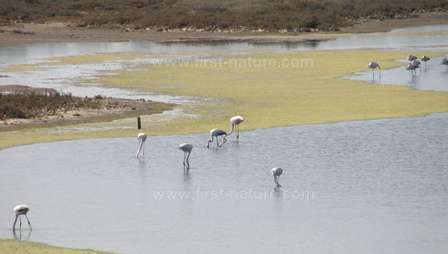 This is also an excellent birdwatching site and one of the best places to see Flamingos, which appear regularly in various spots along the coast of the Algarve. The route down to this site is a rough track, but there is a car park beside the water and a rocky 'cob' which runs between the beach and a lagoon. See map at the bottom of this page. In 2011 a massive programme of improvements to the waterfront at Alvor included the building of a boardwalk and a cycle and jogging trail through part of the reserve. This excellent facility allows people of all mobility levels to see and enjoy many of the wildlife species without damaging fragile habitats by walking directly through them. 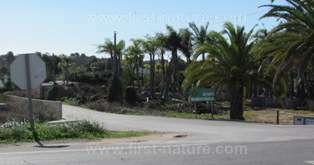 If approaching from the A22 toll, road take Exit 4 and follow signs to Alvor. From the N125 follow signs to Alvor, which lies between Portimao and Lagos on the western side of the Algarve. Once you reach Alvor continue through the town following signs for the beach (Praia) and then follow signs to 'Praia Accessivel,' where there is a large car park very close to the start of the boardwalk and the beach. There are various places to park at the beach and along the town's waterfront. The walks along the Alvor river are reached from behind the town church, which is on the junction of Rua da Ingreja and Rua 25 Abril - see map below. There is ample car parking at the reserve, and a series of walks along the boardwalk which, with the benefit of a number of loops and spurs, can be as short or long as you like. Some of the walks lead directly onto the superb beach at Alvor, while others head inland towards the pretty little tourist town of Alvor itself. You can also walk along the edge of the river estuary in a loop which brings you back to the car park. Please keep to the boardwalk or track at all times, and keep your dogs under control to minimise damage and disturbance to the wildlife in general, and nesting birds in particular. There are plenty of cafes and restuarants in Alvor, some of which are right on the beach at the start/finish of the boardwalk. There are public toilets in the main street of Alvor, which leads up from the waterfront to the centre of the town. The Alvor river estuary and surrounding area has diverse habitats. As well as coastal sand dunes there are wetlands including mudflats, salt marshes and salinas (saltpans). In some areas the sand dune system is accreting (forming new dunes), and this highly mobile environment is vital for many so-called pioneering species of wildlife which can only exist in unstable sand dunes. Excessive stabilisation of sand dune systems throughout Europe, although thought desirable in the past, has lead to severe decline and even extinction of many species that can only survive in this strange, highly-mobile habitat. The Alvor Estuary is one of the finest places on the Algarve for birdwatching. Along with other parts of the coast the Alvor river estuary is a stopping-off point for many migrating birds as they undertake their spring and autumn journeys. 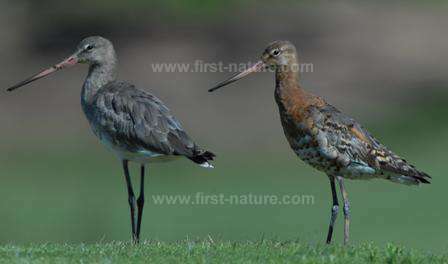 Among them are Dunlin, Knot and Redshank. It is also an excellent place to see resident birds, and on a recent visit we saw two Kestrels hunting across the large open area of sand dunes and maritime vegetation for small mammals that make their homes in these harsh coastal conditions. Little Terns, Sandwich Terns, Common Sandpipers, Black-winged Stilts, Redshanks, Ringed Plovers, Black-tailed Godwits, Avocets and Flamingos are all recorded from this lovely nature reserve. The rare Purple Heron puts in an occasional appearance, too, and the Grey Heron is a common sight along with Little Egrets. Along the cliffs at Quinta da Rocha Jackdaws and Rock Pigeons are common, and in summer flocks of Alpine Swifts use the rocky crevices to nest and raise their young. In the more wooded areas, with their Stone Pines and evergreen Pistachio trees, other birds dominate the scene - Robins, Sardinian Warblers, Black Redstarts, Great Spotted Woodpeckers and Cetti's Warblers among them. The more gentle farming practices of the Algarve tend to do less damage to wildlife habitats and species than do the modern intensive farming methods employed in other parts of Europe, and so the farmland in the estuary is also home to many birds - for instance Goldfinches, Serins and Chaffinches. This area of land is also a great place to see Bee Eaters, Blue-backed Magpies and, in summer, speedy Red-legged Partridges rushing their young from one bit of cover to another. Despite the inhospitable condtions in the sand dunes a number of animals make their homes there. Wood Mice (Apodemus sylvaticus), foxes and hedgehogs eke out an existence, but you are unlikely to see them during the day: dawn and dusk are the times when they feel safe enough to venture out in search of food. 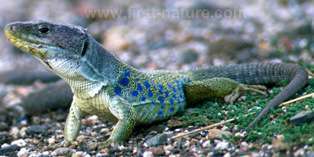 Reptiles live in the dunes, too, Algerian Sand Lizards and the large Ocellated (or Eyed) Lizard are present, as also is the Ladder Snake. In the intense heat of summer it is hard to imagine the huge variety of flowering plants that grow in the sand dunes, although there is one species that is tough enough to have its main flowering season well after all the other species have given up and decided to rest during the hot and dry summer. 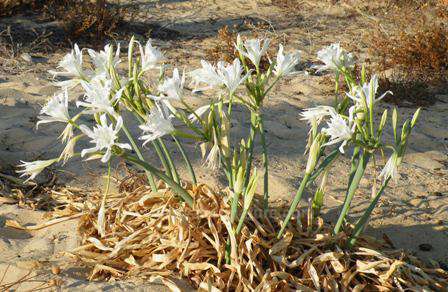 Sea Daffodil (Pancratium maritimum) comes into flower in July and persists through August and into September. Spring comes early in the Algarve. Not long after the rains of autumn start, plants are stimulated into growth. In warm and wet autumns and winters you will see many of the spring plants appearing as early as November, with the real pioneers coming into flower in December and January. By the end of February and early March the Algarve floral fireworks display is well under way, and at Ria de Alvor some interesting and rare species such as Camphor Thyme (Thymus camphoratus) and Algarve Toadflax (Linaria algarviana) will be in full bloom. Sea Holly (Eryngium maritimum) thrives in the sand along with Sea Medick (Medicago marina), Sea Stock (Matthiola sinuata) and many others. In the wetter edges of the river estuary you can see the massive Cistanche (Cistanche phelypaea). This huge, bright yellow flower is a member of the Broomrape family of plants, and the Alvor Estuary is at the edge of its western range, but it also occurs further east at Ria Formosa. Cistanche is a parasitic plant, obtaining its nutrients from other plants such as saltworts and goosefoots which can also be found growing in the sand at Ria de Alvor. The turn towards the western side of the Alvor Estuary is off the N125 road between Alvor and Lagos - on the left if you are driving towards the west. This rough track, signed to a tree nursery, crosses the railway line and continues through an area of farmland sloping gently down to the estuary itself. This track is an excellent place for spotting birds. Bee Eaters seem particularly fond of the telephone wires that run along each side of the road! At the end of the track are a number of meadows which have lovely displays of wildflowers, especially in the spring when the Paperwhite Narcissus (Narcissus papyraceus) comes into flower; they are most abundant in December and January, so don't leave it too late if you want to see these lovely plants which are such a speciality of the Algarve. Because of the warm and sunny weather that the Algarve experiences for most of the year, there is always something of interest to see and enjoy. The Alvor Estuary is a very special place to enjoy watching a lot of the wonderful wildlife species that live in the Algarve. It will take several visits, walking in different parts of the reserve, to see all that it has to offer.